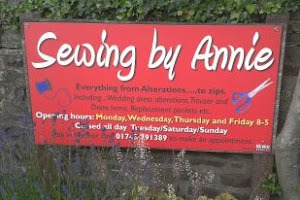 There is so much going on over here at Sewing by Annie's at the mo. What with theatre visits to see some pretty hunky young men work their magic on Sunday night [see post below] to a really wonderful workshop on our Funday Monday [see Twiglet's blog to catch a glimpse of the pretty dress she made]. There is always something going on here. On Saturday, whilst in Shrewsbury, we popped into a few charity shops looking for pillow cases to make some dresses to be sent to Africa. 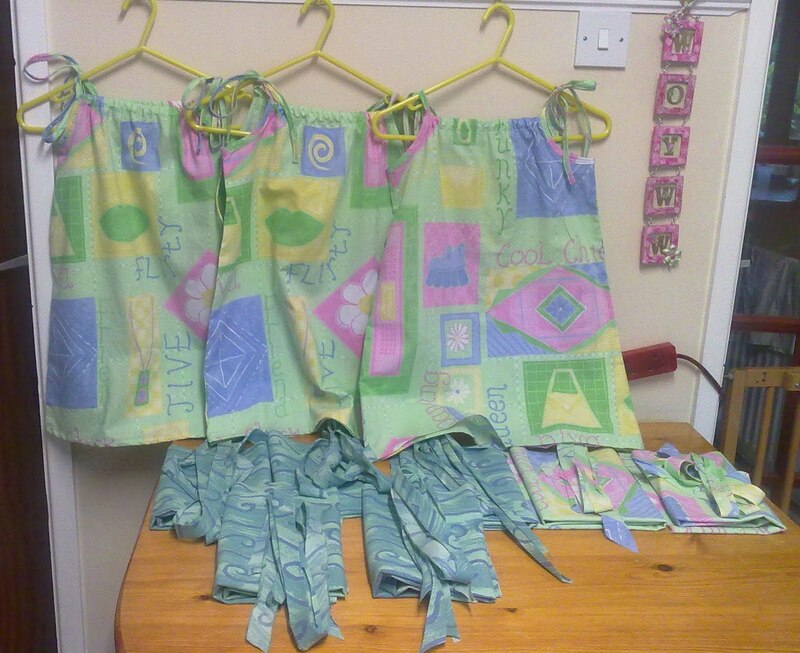 If you check out Louise's blog at Sew Scrumptious you will see she is a collection point for these dresses and has now gathered over 100 [50 of which have already been taken out to Malawi ]. I have been watching this collection growing but had been really busy with the sewing business til now but was determined to join in by making a few. 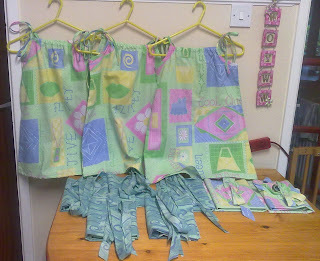 I was unable to find any suitable pillow cases but managed to find two single quilt covers [just £4.50 for the two so the charity shop benefited too] and after cutting curtains first thing Monday morning Twiglet and I set to and cut out 10 dresses from the quilt covers. Our friend T arrived for our Funday Monday armed with her own pillow case and we set about making. What a brilliant afternoon we had. There was much laughter and learning going on and of course the compulsory drinking of coffee/tea and eating of chocolate [thanks T]. Here is what was achieved in just one afternoon. 3 pretty little dresses. [Would have been more if I hadn't been disturbed by customers...they are just so thoughtless aren't they? :-) ] We cut self fabric bias strips for binding the arm holes and straps and these were easily pressed into shape using my clever bias binding making tool. [wouldn't be without it]. This is my 'to do' rail today. I know....boring boring boring but the, now 1098 customers, I have seem to like coming back for more :-) I'm still getting 2/3 new customers every week....where do they all come from? ...and yes, that includes curtains :-( huge ones that I have to shorten and join together back to back to make a door curtain! And of course I have to leave you with a bit of colour out of my garden for this rather gloomy week. Hold on to your hollyhocks girls!! Thanks for calling in. Please leave me a comment if only to say hello and then pop over to Julia's blog to join in the WOYWW fun. I saw the dress at Twiglet's and remembered the project from last week. What a sweet gesture you two are making. And I love those hollyhocks. They don't grow well where I live, I suspect because it's too hot and dry. Have an awesome WOYWW. Now I'm really off to bed! Great pillowcase dresses - fun pattern and a really worthwhile cause. Your hollyhocks are glorious - very rampant :) Have a good week!! Love the hollyhocks, but what pretty pretty dresses, and such a lovely idea. Like I said on Twiglet's blog, you put us to shame. Lovely hollyhocks. Well done those dresses are fab. 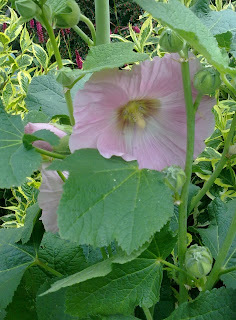 I hadn't seen hollyhocks until i moved to Turkey. I dont think the soil is good, or maybe the cold in Scotland for them, but i love their vibrant colours and big flowers.....if only they would fit on my Layouts! Beautiful flowers and absolutely gorgeous dresses. You two are so clever and doing such a marvellous charitable deed. I take my hat off and bow to you both. Those dresses are so lovely and I too hope to make some soon. 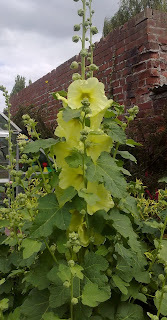 Love the hollyhocks.. never have success with these in my garden. Thanks for your wishes and try to pop back as I've thought to add some of our ancient wedding pics! Go on... have a larf! hope the babes to be are being good for their mums! Ahh such cute dresses, you must be so fast! Glad to hear you are getting lots of customers, I can imagine they get in the way of your hobbying a little :o) but it's all good! 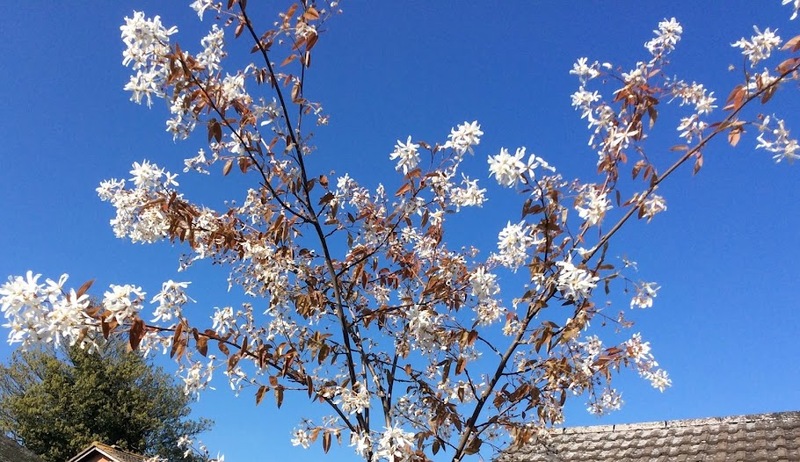 Your flowers are looking very impressive too. Thanks for sharing. Oh I loved this post and the one bellow too - ha, ha especially the "very handsome bit" Those dresses are soo cute - colors are almost the same as the hollyhocks! 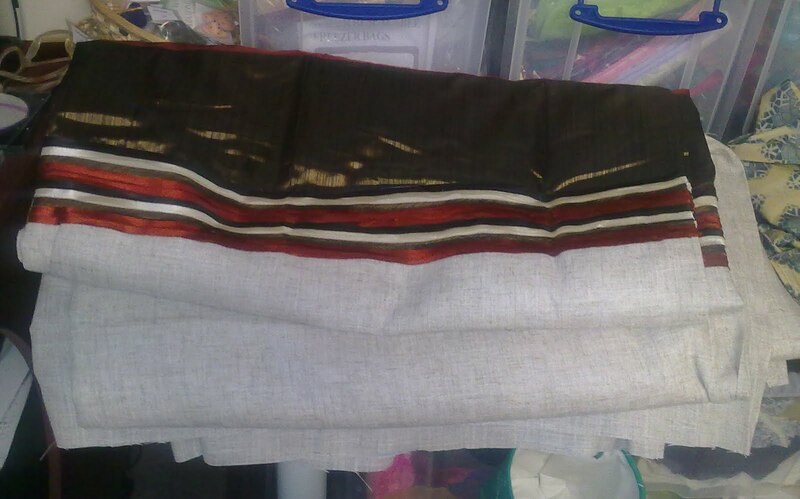 Sewing curtains is a boring job to me! Huh! Lots of fun stuff going on! Pretty flowers! It always leaves me feeling tied after reading your blog Annie because you and Twiglet are always so busy. 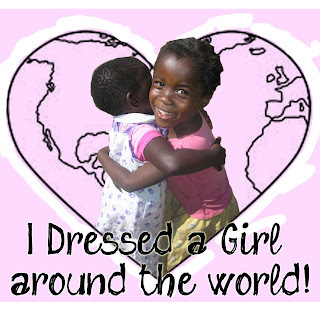 Loving the cute little dresses and for such a good cause too! Loving the Hollyhocks by the way. They are so pretty! What a fab project to take on! I agree (although I am so late I see the next post, not just WOYWW :)) the blue ones are so sweet there will be no problem with multiples! Good heavens do you ever stop! Those dresses are amazing! Love the hollyhocks! 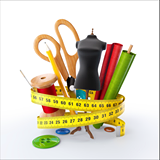 sorry Wipso wee bit late this week wow you are busy so many posts above this too...I really love the dresses for Africa and have two sets of friends over there so know what you mean one in Rwanda and the other in Zambia. So much poverty! I'm very very late this week, but no matter, it means I've caught up with all your doings without panic reading!! How like you and Twiggers and T to enjoy a day of charity work - great great dresses. And oo err mrs, thems big 'olly'ocks!! Gorgeous Hollyhocks, Wispo. I've never had any success with them. Glad to see you are keeping busy and those charity dresses are great. I'm very envious of your Blake trip. I love them too. Happy WOYWW and sorry for being so late visiting.